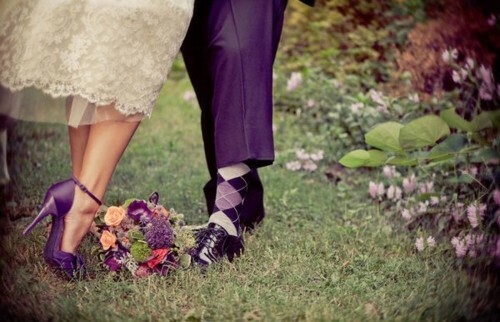 We’ve all seen it, the picture of the bride and grooms feet on the wedding day! Such a big trend right now, this shot is a must! 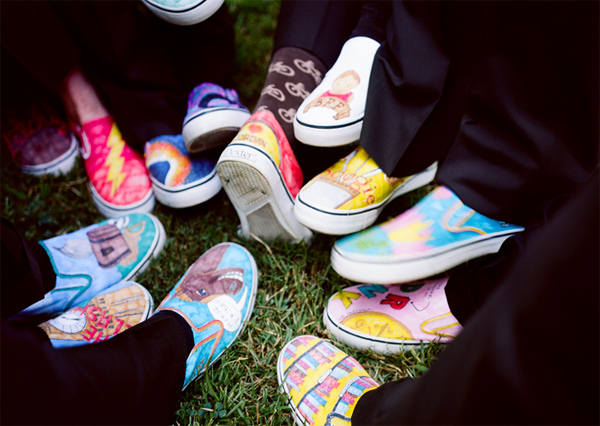 The shoes that you wear on your wedding day can really show your personality, and obviously are key to getting a great “shoe” shot! 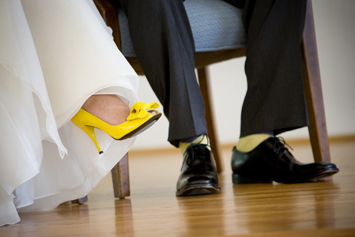 Your wedding shoes are a great way to be original or to tie in a splash of your wedding colors! Knowing that this photo will probably be taken, put some heavy thought into your shoes (or even his socks!) on the big day to create a fun, creative photo. Ladies, I know it seems like your feet will be covered, so do your shoes don’t really matter. Your dress will not allow your shoes to really be highlighted right? WRONG! Your shoes will be a huge focal point ladies, so think of ways to really let your style shine here! You need to find a balance between comfort and style, but know that photos of your shoes will be taken, so why not make them fun?! Wouldnt yellow satin pumps be just amazing? Or Purple Patton leather peep toes to match your flowers? 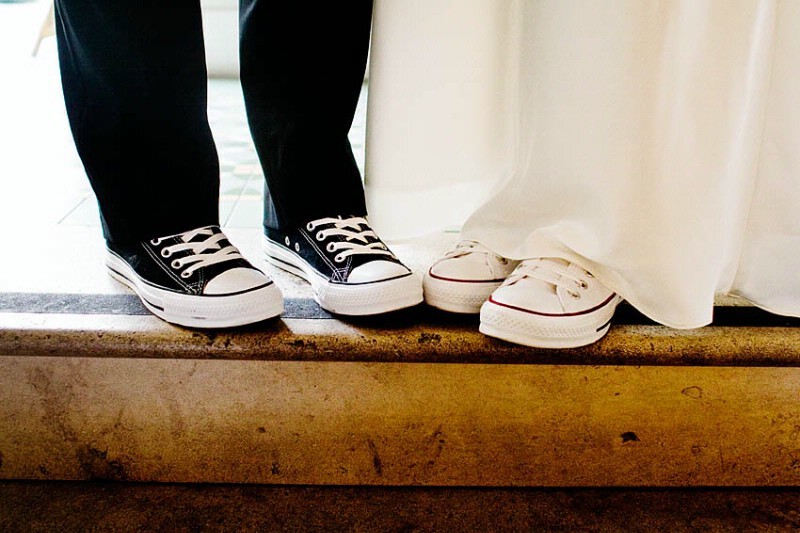 If you are worried about comfort, you can always change your shoes during the reception… after the feet photos have been snapped! Men, this goes for you also! Why suffer in those uncomfortable tux shoes that come with your rental? Upgrade please! A nicer pair of dress shoes will make such a difference (and will really help when you’ve been on your feet all day long!). 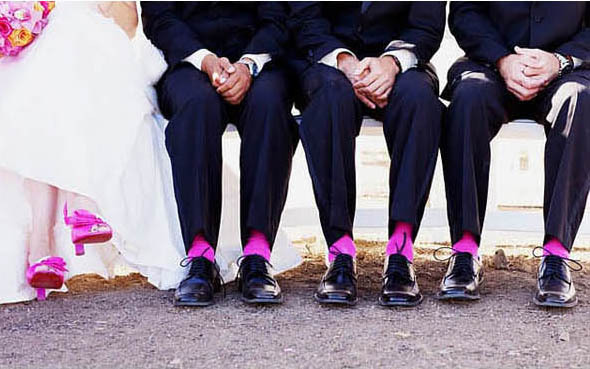 A groom can really be unique by wearing a different pair of shoes on his big day, or even changing his shoes for the reception to be a little more relaxed. 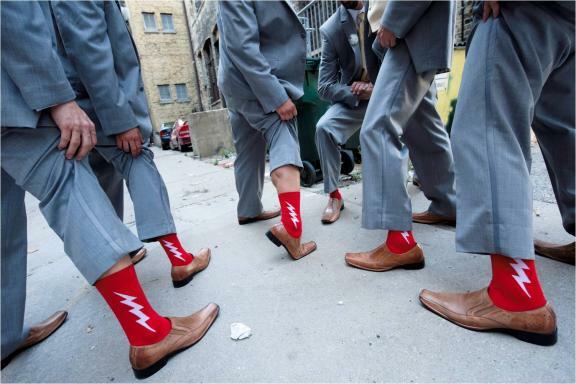 Socks also make this photo one for the album…. adding a bit of color and creativity on those feet! I spent weeks on my wedding shoes. Weeks and weeks in front of the TV, working away. I bought white satin heels, and by hand, glued hundreds of rhinestone on them! This girl couldn’t afford to spring for the Christian Louboutin rhinestone encrusted stilettos, so I made my own! 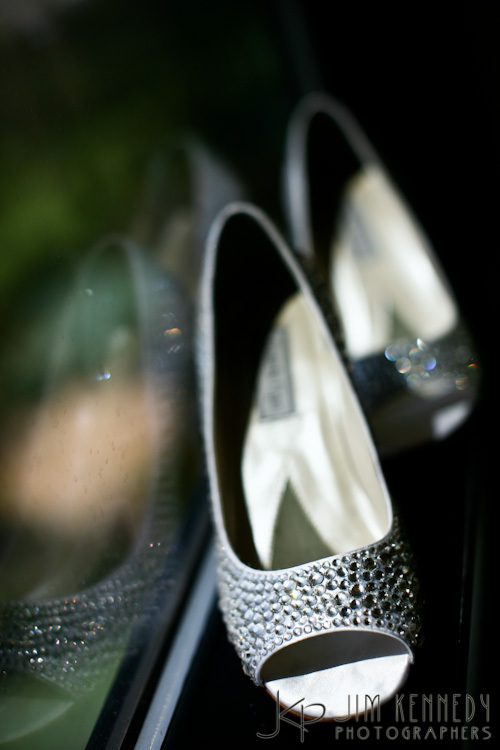 They were just the bling I wanted on my feet to walk me down the aisle! They were so fun to show off on the wedding day, and looked so great in my photos! Take a look at a few of my favorite shoe photos (and a few of my own!). Such fun shots, such creative couples! Lift up that dress ladies…. let me see those shoes!